For book people, the biggest question when taking a trip isn't What should I wear? What should I pack? Which suitcase should I bring? No, of course the vital question is, What am I going to read on the plane? I'm leaving pretty soon to spend Thanksgiving week with my family in California -- a six-hour flight, plenty of time to get into something good. I love recommending plane books to customers -- it's a chance for them to spend a big chunk of time reading, and a good way to sink deeply into books that would suffer from short bursts of reading time. I tend to favor books that are rich and meaty, but not too heavy -- you don't want someone to get off the plane in a blue funk. It all depends on the taste and mood of the reader, of course -- some people want a beach read, and some want to tackle the Dostoyevsky they've been meaning to read since high school. 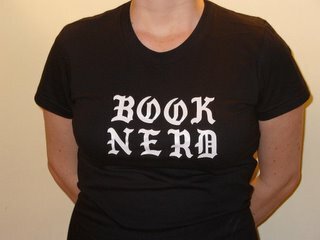 It's highly ideosyncratic, different every time, and lots of fun if you happen to be a book nerd. Since I wasn't able to lay my hands on a copy of Vollman's EUROPE CENTRAL, I've been toying with books already on my bookshelf as potential plane reads. The two top choices right now are THE GOLD BUG VARIATIONS by Richard Powers and MILL ON THE FLOSS by George Eliot. I fell in love with Powers' most recent book, THE TIME OF OUR SINGING, when it came out a couple of years ago, and I've been working through his backlist ever since. He definitely passes the dense and meaty test -- he's astoundingly brilliant, his sentences are linguistic and witty treats, and his subject matter is the stuff of "serious play" -- making connections between the largest themes of life. As I describe him to people, each of his books finds a perspective, and from there is about the entire world. TIME OF OUR SINGING was about relativity, music, and race in America; THREE FARMERS ON THE WAY TO A DANCE was about photography, progress, innocence, and World War I; PRISONER'S DILEMMA (reportedly the model for Franzen's THE CORRECTIONS) was about family dynamics, World War II, absolutes of morality, and Disney. The next one on my list is apparently about genetics and music, and it's a weighty one, all right. If I get into Powers I'll be blissfully dead to the world; if I'm too distracted, it will be hard to absorb his complexity. I'm thinking of Eliot because I read MIDDLEMARCH last year about this time, and was amazed I'd never read it before. The author seems to me to combine the sense of delicate interpersonal dynamics of Austen, the gray-shaded but high-minded morality of Dickens, the social awareness and conscience of, I don't know, Karl Marx, and the sense of the subtle flow of events of Woolf. She's truly a wide open mind, and her book was absorbing and thought-provoking. I have a nice little mass-market edition of MILL ON THE FLOSS, so that might be a good choice. Then again, there's always P.G. Wodehouse. And I suspect I may indulge my travelling habit of buying a brainless newspaper in the airport. Oh well -- you've got to aim high.